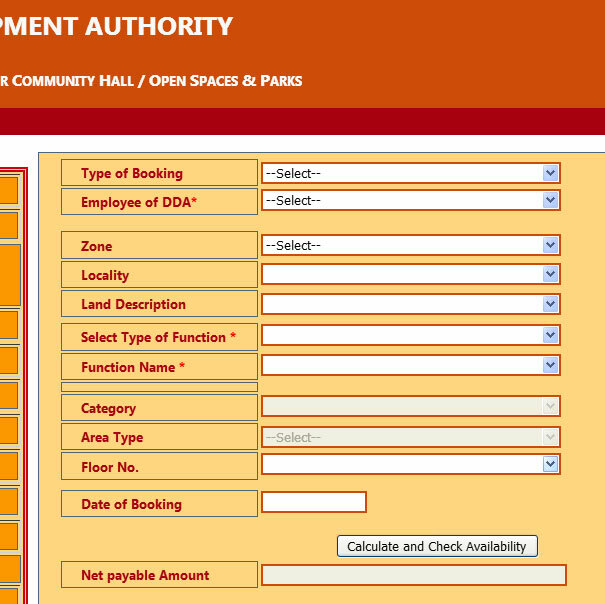 How to Check Rates for DDA Community Hall Online Booking? If you are planning to book DDA Community Hall or Open Space for some sort of function like family function or marriage, you can do so easily. Here we have mentioned the DDA Community Hall booking rates or DDA Open Space booking price. Category, Area Type, Total Area in Sq. Mtr. and Built Area in Sq.mtr. would automatically be populated. Just Select Floor No. Information about Booking charges, Cleaning charges, Security Deposit, CGST and SGST would be displayed below the NET Payable Amount for booking DDA Community Hall. Hope that's some useful information for people who want to book online DDA Community Hall or Open Space and wish to know the exact charges that they need to shell out.